So during this time I was looking for products to help me along the way and get me back to loving my locks and these are some of the products I've been loving. So firstly, this may come as a surprise to some of you but the Joey Essex Sea Salt Spray is SO good! I got this as bit of a novelty item if I'm being completely honest. Not that I am a huge Joey Essex fan or anything but I saw it on offer in Tesco and picked it up. The reason I love this so how practical, effortless and easy to use. I use this when my hair is damp and spray it in a give a rough blow dry. It adds an extra wave to my natural hair and has me good to go. My second beloved product is the L'Oreal Elvive Extraordinary Oil . You have probably heard this being raved about all over the shop and I really do understand why. The shine this gives my hair when it's feeling lifeless is amazing. I use this after I've washed my hair with the Shampoo and Conditioner from the same range. After rubbing a pea sized amount in my palms I go in and evenly distribute this through the ends of my hair. The reason I say the ends of my hair is because I find any sort of oil near my scalp leaves me with them nasty greasy roots. Next I move onto the product that gives my hair that added Omph and volume. This is the Schwarzkopf got2b Powder'ful Volumizing styling powder. This is like fairy dust in a little bottle. I used to love using dry shampoo to not only get rid of all that greasy hair but I felt it was really great at adding volume - But the only thing that I hated was the smell. No matter what, any dry shampoo I have ever used smelled horrible to me (if you know any nice smelling ones let me know below please), This is where this little bottle of goodness comes in handy. The way it works is you dust a small amount into your hands and rub together them together. It was disappear before your eyes, but somehow it's still there. You then run your fingers through your roots and boom you have voluminous hair! It's great for everyday and gives you the perfect lift but you don't have to worry about a horrible smell or white marks! The next product is somewhat of a myth to me. I've been using this for AGES and it has become one of my holy grail hair care products but somehow there is NO sign of it online at all. I've done the usual google search to get you all a handy link to get your hands on it but it's nowhere to be found?! But the secret product is the Pantene Pro-V | Perfect Layers Leave In-Conditioner I can't even remember where I purchased it from initially but as I am currently trying to grow out my hair this helps keep my layers defined and give me a put together look. Like all Pantene products this smell soo good and does what it says on the bottle. Finally, my favourite hair styling tool at the moment are these round brushes from Primark. At a steal price of around £2 these are amazing at adding volume to the roots and creating the perfect blow dry. Anyone who knows me knows the only day of the week any effort is put in my appearance are Saturdays and when I'm putting in that extra effort this helps me get my desired look. I use the thick brush to speed up hair drying and lift my roots while the smaller brush is perfect to help me style my fringe (which is so grown out right now). And there you have it. 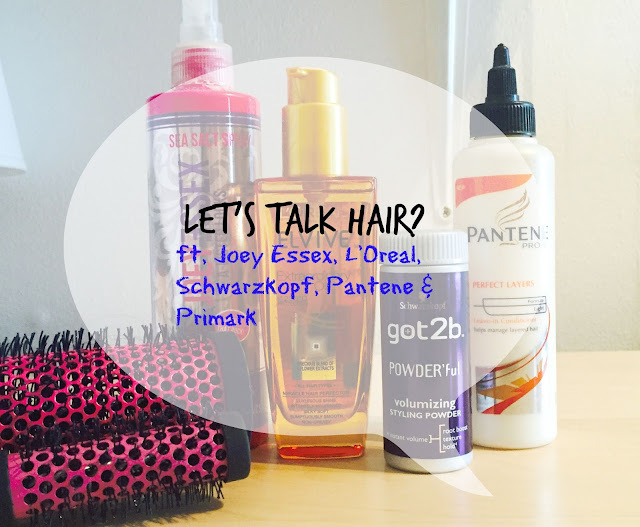 My top hair products at the moment! Let me know some of the products you and your hair have been loving recently and help me get out of this hair rut I'm currently in!